Jim Denomie lives and works in Franconia MN. 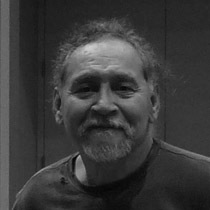 Born in 1955 on the Lac Courte Oreille reservation near Hayward WI, the Anishinaabe artist has won numerous awards including artist fellowships from the Bush Foundation (2008) and the McKnight Foundation (2012, 2018), the National Artist Fellowship, Native Arts & Cultures Foundation, Vancouver WA (2018), and an Artist Initiative Grant, from the MN State Arts Board (2018). He has been invited to participate in Imagined Communities at the Sesc Videobrasil, Art Biennial in São Paulo opening October 2019. In 2015 Denomie was awarded a Painters and Sculptors grant from the Joan Mitchell Foundation, and in 2017 he completed the Joan Mitchell Foundation Artist-In-Residence program at the Joan Mitchell Center in New Orleans, LA. His work is found in numerous private collections and in the public collections of the Heard Museum in Phoenix, the Minneapolis Institute of Art, the Walker Art Center and the Weisman Art Museum in Minneapolis, the Minnesota Museum of American Art in Saint Paul, the Denver Art Museum, and the Eitlejorg Museum in Indianapolis, among others. Denomie’s work has been shown extensively in the U.S. including exhibitions in Chicago, Los Angeles, New York City and Seattle, and in Germany. In 1995, Denomie received a BFA degree from the University of Minnesota.